Tostada bowls are just plain fun! Scooping out the tasty ingredients using pieces of the tostada shell is the best part! 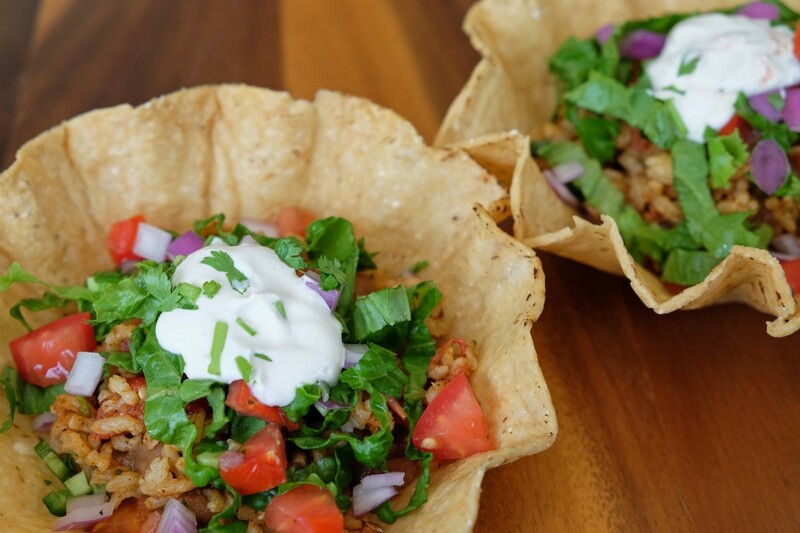 This recipe combines my favorite tostada shells with home-made rice, beans, salsa, and guacamole; topped off with vegan sour cream. Great for Mexican dinner nights or parties, tostada bowls work as a DIY dish where each person can customize their own bowl. Flavorful, crunchy, and satisfying; I hope this dish is a hit at your next fiesta! Keep all the side dishes ready and chop everything. When ready to serve, warm the oven to 350 degree F.
Take a tostada bowl, put little vegan cheese in it. Let it bake for 2 minutes until the cheese is melted. Put on a serving plate and top it with beans, rice, guacamole, and salsa. Garnish it with lettuce, chopped tomato, red onion, jalapeño and vegan sour cream. Serve immediately. The unused tostado bowls can be stored in a ziplock bag and used within a day or two for fresh results.